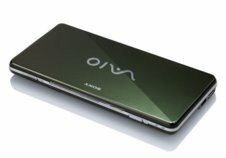 Sony’s latest Vaio addition is lightweight and slightly unusual looking, featuring an 8-inch widescreen, which is designed to minimise the amount you have to scroll horizontally – a common side effect of all that lightweight netbook loveliness. It’s to come in red, dark green, black and white, further confirming its place in the good looking laptop line. There’s built-in GPS, and 3G, although there was no mention of markets outside the US – here in the UK we’ve already got a few cheaper models toting 3G from the likes of Vodafone and 3, so you’ll have to stay tuned to see if they can find a Verizon equivalent. In terms of operating system, it runs Windows Vista, although you can boot it up in Sony’s XCrossMediaBar mode, which allows fast access to functionality such as IM and internet browsing. It’s packing an Atom processor, a 60GB HDD and 2GB of RAM. It’s available to pre-order now, for £849. So yeah, it’s no netbook.